If your family has lived at a particular location since Hector was a pup, you might have all the information at hand by simply talking to some ancient relative. However, most of us are not fortunate to have a live-in historian locked in the attic, and may want instead to turn to some sort of printed or recorded sources such as a book, clipping file, document, photograph, drawing, blueprint or manuscript. So, you will want to turn to the rich holdings in the library's New Jersey Information Center. Here, under one roof, are to be found nearly all the sources needed for your building renovation, rebuilding or reassembly. Warning: be prepared to exercise considerable patience, and take a lot of time as your architectural jig-saw results in the eventual rebirth of your favorite building. A visit to the library's New Jersey collection will produce a variety of materials useful in restoring or maintaining that special historical structure. First, there are general histories which illustrate some of the community's better-known buildings. But it is the many thousands of pictures, postal cards, fire insurance atlases, city directories, blueprints, and the New Jersey Illustration Index, as well as the Berg and Dust collections which will give details of many of the city's lesser-known buildings. The New Jersey picture collection is one of the nation's largest local historical graphic resources, relating to both New Jersey and Newark. It includes tens of thousands of individual architectural views from the earliest to present times. There are approximately 35,000 graphics in the Main Library's New Jersey collections and hundreds of thousands in the Newark News morgue stored off site. Pictures are retrieved through an index system which has been heavily used over the years by researchers, scholars, business people, history buffs, genealogists, and the curious. The clippings files are perhaps the richest source for architectural information in local history collections. For almost 100 years, the newspaper has been clipped for information about our buildings. These abundant files include folders of historic houses, places of worship, factories and commercial buildings, public buildings, and centers for entertainment, from the completion of Robert Treat's home in the early 17th century until the future laying of the final brick in the new Performing Arts Center. You will be richly rewarded by using this collection. The fire insurance atlas, a generic term applied to large multi-volume illustrated color plate maps of the city, was originally intended for companies selling property insurance but they are priceless for historical research today. They described the exterior features of all the buildings in the city in great detail, the type of roof structure, cornices, fenestration, location on property and the like. These maps usually did not include a drawing of the building, but they did a pretty good job of describing the structure in general. In the past 130 years there have been several sets of these publications. They are usually referred to as the VanDuyne and Sherman, Scarlett and Scarlett, Lathrop, and Robinson atlases in addition to the Sanborn atlases. Modern editions of these publications have appeared in photocopy editions, as color transparencies, and are available in computer base also. The city directory, another building block of architectural research, is basically an overblown telephone directory. It has a listing of local residents living or working in town. First published in 1836, it later enumerated local residents by last name. In the 20th century it expanded to tell you who lived at a particular address and later who was assigned to a particular telephone number. For our purposes, it is important for the woodcuts and drawings of many industrial and commercial structures. By using the The Historic American Building Survey you could rebuild one of Newark's historic buildings from scratch. During the Great Depression, the federal government commissioned the study and redrawing of many of the nation's most important colonial and federal period buildings. Projects were completed in each state, and the New Jersey Information Center has a complete set for both New Jersey and Newark. There are two filing cases filled with the 8 by 11-inch black and white sketches for New Jersey and for Newark and the library has a complete set of full scale drawings for Newark. No detail has been omitted, and from the dozen or more sheets for Old First Church you could reconstruct the central steeple, recarve the decorative star over the altar, or redress the building's original exterior walls or the deeply cut quoms. Besides being beautiful, accurate, and interesting the blueprints are our only record of several now vanished buildings such as Newark's Lloyd Houses. Two special architectural collections in the New Jersey Room of the Library of special interest are the Berg Collection and the Dust Collection. The first was assembled by Dr. Samuel Berg, longtime resident of Newark. In addition to being a generous patron of the entire library, his personal interest was in photography. Berg recorded a changing city of the 1950s and l960s for use by us forever. His lucid photography, his selection of sites, and his careful identification of each location by street address and block and lot number have earned for him the title of 'the visual Samuel Pepys of mid-20th century Newark.' Donald Dust, founder of the Newark Preservation and Landmarks Committee, is remembered among other things for the collection which bears his name. It consists of all the historical nominations submitted to both the state and federal building registers. In past years these nominations were relatively brief; however, recent proposals have become booklets with many pages of historical, architectural, building and legal detail. Not only does the library collection include the successful nominations, but also the unsuccessful, many of which are excellently conceived and contain a wealth of information not available elsewhere. Even more resources than these are available to you. 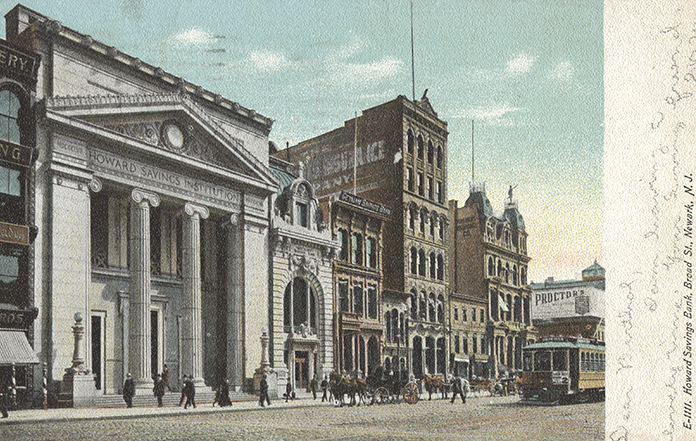 The New Jersey Historical Society, which will reopen after a move to a new headquarters on Park Street at the old Essex Club, and the Newark Museum Library and its priceless works of art depicting Newark as well as the blueprints held in the city's Engineering Office at City Hall are of incalculable value in an extended study. So go and use them. Learn about your building, and take your place in the preservation effort!